The Thalia Theatre was located at 46-48 Bowery (between Bayard and Canal Streets, across the street from the Windsor Theatre) in Manhattan. Renown Yiddish actor David Kessler was awarded the Thalia Theatre in a divorce settlement in 1899. Here he is listed as being the Lessee and Manager. Sigmund Mogulesco is the Regisseur and B. Young is the Theatre Manager. 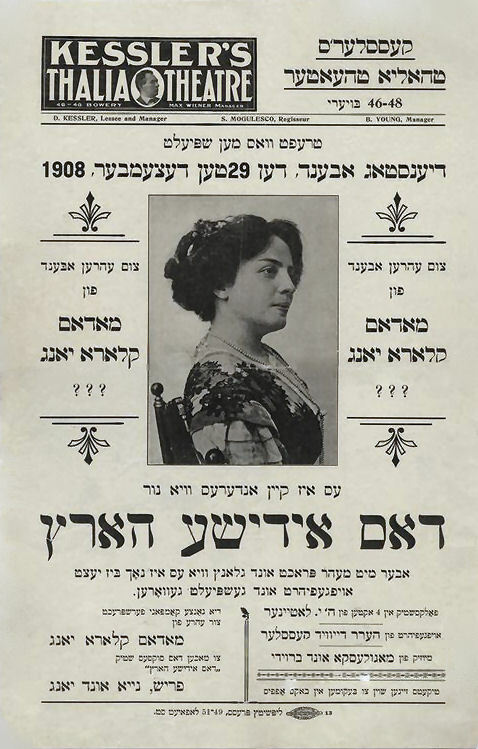 The placard announces the 29 December 1908 evening performance of "Dos Idishe Harts," or "The Jewish Heart." Perhaps this is a tribute to star Clara Young. Also mentioned are author Joseph Lateiner, David Kessler and Mogulesco. photo: courtesy of the New York Public Library Digital Gallery.